The 2013 Spirit of Giving Award winner was Bob Buttar (on right) owner and broker of Coldwell Banker Haida Realty. The award was presented by Camex Equipment's COO Rob Salmon (on left). The event that so many people look forward to all year long finally arrived on Friday, December 6th and a full house packed the large ballroom at the Nisku Inn for the annual Leduc & District Chamber of Commerce Spirit of Giving luncheon sponsored by Camex Equipment. An event that truly engenders the spirit of the season, this luncheon is all about giving back to the community and in true Leduc style it is always well attended and well supported, with many charities receiving enough donations to see them through the next several months. Before the attendees entered the ballroom they were greeted by the big man in red who welcomed them to the event. Then on a slightly more sombre note volunteers from RiseUp House pinned a white ribbon on everyone in recognition of the National Day Of Remembrance and Action on Violence Against Women which was established in 1991 after the 1989 murder of 14 young women at l'École Polytechnique de Montréal. Upon entering the ballroom guests were treated to a glass of complimentary wine sponsored by Leduc Truck Service/Moving and Storage, DK Ford, Melanie Gesy Professional Corp., and the Leduc Co-op Liquor store. A beautifully decorated room was topped off with gorgeous centrepieces donated by the Leduc-Nisku EDA and these were gifted to one lucky recipient at each table at the end of the luncheon. After a fabulous buffet of turkey and stuffing with all the fixings, Chamber Executive Director Shaun Green officially opened the luncheon by acknowledging the passing of one of the world's great men by quoting him saying, "There is no passion to be found playing small – in settling for a life that is less than the one you are capable of living." – Nelson Mandela. Next, Mr. Rob Salmon, COO of Camex Equipment was welcomed to the stage to announce the recipient of their Spirit of Giving Award. This award is given to a person or business that has made long term and significant contributions to Leduc and area. 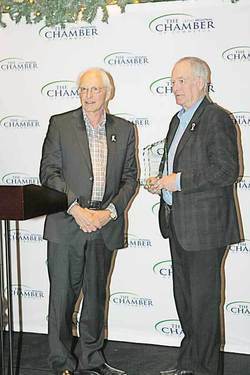 Mr. Salmon revealed that the 2013 award was being given to Coldwell Banker Haida Realty's owner and broker Bob Buttar. For many years it was a well kept secret of who placed the flags on every lawn in Leduc on Canada Day but a couple of years ago it was leaked that Haida Realty was the entity behind this beloved tradition for the last 17 years. Less well known is the company's support of numerous local charities and organizations including the Foodbank, Night Angels, the Festival of Trees, and Leduc Minor Hockey to name a few. A visibly touched Bob gratefully accepted the award and acknowledged the "incredible team" of people that he worked with at Haida Realty. After Bob retook his seat the much anticipated portion of the afternoon got underway with numerous cheque presentations to local charities. The first presentation was from Royal Lepage Gateway Realty in Leduc where each of the realtors donate a portion of each of their commissions earned throughout the year to a local women's shelter. Each of the donations is also matched by the company and up until this year their donations had been given to a women's shelter in Edmonton. This year Gateway applied to their association and had RiseUp House accepted as one of their recipients, and they were thrilled to announce at the luncheon that their first donation to RiseUp would be $3,000.00. Next, a group of Leduc/Nisku Rotarians were invited onstage to present two cheques. Rotary is an organization that has a mandate to help improve their local area through volunteering and fundraising, then donating the funds raised to other worthy organizations. Their first presentation was to gift Santa's Helpers with a cheque for $500.00. Santa's Helpers provide children's Christmas gifts and holiday food hampers to struggling families that might not otherwise be able to celebrate the holidays. The next lucky cheque recipient was the Leduc & District Foodbank who were presented with a cheque for a staggering $9,000.00! The VLT Operators Group representing local businesses such as Smitty's, the Days Inn, the Denham Inn, Boston Pizza and Blackjack's Roadhouse amongst others, also chose the Foodbank as their charity of choice, presenting them with a cheque worth $2,500.00. The Leduc Remax Realtors put a twist on their donation by purchasing dozens of new toys and placing them under a beautifully decorated tree at the back of the room to donate to the Foodbank for their Christmas Hampers program along with a cheque for $500.00. Another huge supporter of Leduc and area charities, Second Glance Board Chair Linda Blumenthal took the microphone for a moment to thank both the Pipestone Flyer and the Leduc Rep for their continual support in "getting the word out" about all the good work Second Glance does and informing the public of exactly where their dollars go. She shared that in 1980, which was the first year that Second Glance was formed they donated $1,000.00 to local charities. This year to date, with a lot of support from the community, Second Glance Gave back over $130,000.00! Chamber President Cindy Guy then came back onstage to proudly report that this year's Canadian Tire Festival of Trees which is run by the Leduc & District Chamber of Commerce had raised over $7,000.00 for eighteen different charities. With the presentations over for this year, guests were then reminded to get their tickets early for the next Chamber luncheon on January 24th being held at the Executive Royal Hotel where the City and County Mayors would be giving their annual "State of the Region" address. At the closing of the luncheon one final, unexpected donation was made when City Councillor Glen Finstad was announced as the winner of the 50/50 draw. Being a luncheon inspired by giving, this 50/50 pot was unusually large with the winner receiving a pot worth $392.50. Upon his number being drawn, Glen donated back 1/2 of his winnings to RiseUp House and the other half to the County of Leduc Animal Shelter Society who was the charity that sold the tickets at this luncheon. In spite of the freezing cold temperatures outside everyone experienced a warm glow inside, echoing the sentiments of President Cindy Guy who stated, "I look forward to this all year long and it is my favourite luncheon of the year!" A final quote from Oren Arnold displayed on a large screen behind the podium summed up the sentiments of the day perfectly; “Christmas gift suggestions: To your enemy, forgiveness. To an opponent, tolerance. To a friend, your heart. To a customer, service. To all, charity. To every child, a good example. To yourself, respect."